When it’s quitting time around the brewery the team can often be caught snagging a pint of this British style malt forward IPA. 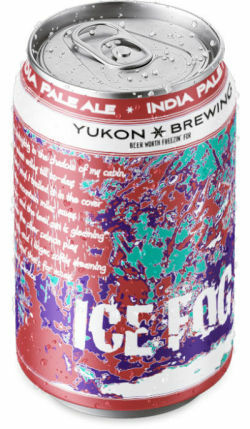 We call it Fog-O’clock and it’s becoming a bit of a Yukon trend! Unlike the hundreds of other IPA’s out there, we’re not going for the “hip and hop” award with this brew, going over the top with bitterness. It’s a session beer for folks who appreciate an IPA with balance. UPDATED: FEB 10, 2019 Bouteille de 341ml. BB 2019/02. Une bière dorée presque ambrée. Un nez de caramel et de malt vieilli. Une bouche sucrée, maltée sans présence des houblons qui caractérisent les IPA. Mauvaise bouteille ? UPDATED: FEB 2, 2019 341 ml bottle from the St Jovite SAQ. Pours a clearish golden orange colour with small white head. Aroma is stewed fruit, biscuit and some woodiness. Flavour has stewed apple, grains and some woody character. UPDATED: FEB 1, 2019 Bouteille de 341 ml. Arôme fleural, sucré et houblonné. Goût d'herbes et de houblon. Goût d'eau surprenament présent pour une IPA. UPDATED: JAN 6, 2019 Bottle - 341ml. Hazy amber body with a thin, white foamy head. Decent malty/hoppy aroma with brown sugar hints. Its malty/hoppy taste is well balanced but rather simple and a bit thin for an IPA. It carries sweet and woody notes and ends with a faire bittersweet finish. Not bad, but rather ordinary. UPDATED: JAN 3, 2019 Bouteille 341ml. Couleur orange brûlée trouble, mousse beige présentant de grosses bulles. Arôme de malt, pain brun. Goût de malt, pain brun, aucune amertume, malt caramélisé, sucré. Carbonatation faible, corps moyen-faible. Ça n'a absolument rien d'une IPA. Bright, brassy colour. Mellow herbal hop aroma, this has a soft biscuity malt, a touch of alcohol, subtle esters and orchard fruit hops. Fairly bitter. Poured a murky orange with white head. Aroma is malts, cardboard, bit of veggie. Taste is light mulched boxes with packing glue. Bottle did not have born on date however, was made in Jan 2013. Won at a home brewers club meeting in 2017. Tasting with Alex, Brian and George (thx, Brian!). Small can. Pours a slightly hazy golden with a white head. Aroma and taste are malty, fruity. Moderate hoppy bitterness. Not bad.